I get asked those types of questions a lot and, as an avid reader and all-around bibliophile, I’m always happy to oblige. I also like to encourage people to read as much as possible because knowledge benefits you much like compound interest. The more you learn, the more you know; the more you know, the more you can do; the more you can do, the more opportunities you have to succeed. On the flip side, I also believe there’s little hope for people who aren’t perpetual learners. Life is overwhelmingly complex and chaotic, and it slowly suffocates and devours the lazy and ignorant. So, if you’re a bookworm on the lookout for good reads, or if you’d like to get into the habit of reading, this book club for you. The idea here is simple: Every week, I’ll share a book that I’ve particularly liked, why I liked it, and several of my key takeaways from it. I’ll also keep things short and sweet so you can quickly decide whether the book is likely to be up your alley or not. If you’ve already read a book that I recommend or have a recommendation of your own to share, don’t be shy! Drop a comment down below and let me–and the rest of us “book clubbers”–know! Lastly, if you want to be notified when new recommendations go live, hop on my email list and you’ll get each new installment delivered directly to your inbox. Alright. Let’s get to this week’s book: Elon Musk by Ashlee Vance. If you like to read biographies to find ideas, models, systems, habits, etc. that extraordinary people have used to improve their lives and achieve great things, then you want to read this book. In case you’ve just arrived to Earth and spend most of your time in orbit, Elon Musk is one of the most fearless entrepreneurs around these parts. He was one of the founders of Paypal, and he used the money he made there to create SpaceX, Tesla Motors, and Solar City, which are space exploration, electric car, and solar energy companies, respectively. Elon’s genius, vision, work ethic, courage, and integrity has earned him billions of dollars and a cult of personality, and rightfully so, if you ask me. His story is a master lesson in the power of big think, hard work, and iron will, and we’re lucky to have people like him working for the betterment of humankind and not selling more knicknacks or creating new ways for us to waste time on our smartphones. The guiding principle at SpaceX is to embrace your work and get stuff done. People who await guidance or detailed instructions languish. The same goes for workers who crave feedback. The world is starved for people that have initiative — people that are willing to venture out into unknown territories and risk time, money, and effort on new and untried things that may ultimately come to nothing. If you can develop this trait in yourself, it’s one of the easiest ways to increase your earning and career potential because there are, right now, an infinite number of problems that need solving, just waiting for someone to come along and figure them out. Why not you? A leader earns devotion by showing devotion and never asks his people to do something he won’t do himself, and you’d be hard pressed to find someone more devoted to their vision and willing to shoulder any burden than Elon. For example, several years ago, when it looked like both SpaceX and Tesla were going to fold, Elon lived in his office. He worked 18 to 20 hour days and slept on a bean bag, 7 days per week, and slept on a bean bag in his office. Employees actually wondered if he was even taking showers because they literally never saw him not in his office. As he sees it, all of the design and technology choices should be directed toward the goal of making a car as close to perfect as possible. To the extent that rival automakers haven’t, that’s what Musk is judging. It’s almost a binary experience for him. Either you’re trying to make something spectacular with no compromises or you’re not. And if you’re not, Musk considers you a failure. Perfectionism can be paralyzing — at some point you have to stop tinkering and just ship it — but too many people think about too many things other than simply making the best product. They fail to realize that the number one best way to grow a business is to make products and services so good that customers tell everyone about them. When you can make decisions, big or small, with this amount of force — when you can say that you’re going to do or not do something and that only death can change this — then you enter a whole new realm of existence. Goethe said that boldness has genius, power, and magic in it, and I’m a believer. The moment you truly commit to an action, plan, or path, all sorts of things align to help you that otherwise never occur. You can find countless examples of this in the lives of the great men and women of history, and can experience it for yourself just as easily. People often say that when you’re on your deathbed, you’re not going to be proud of how much you worked. I disagree. If you spend your life in service of something greater than you and engaged in meaningful work, you’re going to be very happy about it. What you’re not going to care about is how many video games you played, TV shows you watched, or arguments you think you won on Twitter. 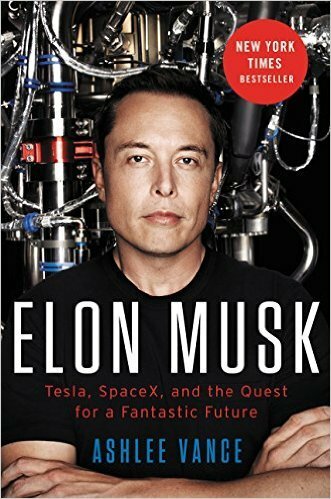 Have you read Elon Musk? What did you think? Have anything else to share? Let me know in the comments below! I'm Mike and I'm the creator of Muscle for Life and Legion Athletics, and I believe that EVERYONE can achieve the body of their dreams. If you like what I have to say, sign up for my free newsletter and every week I'll send you awesome, science-based health and fitness tips, delicious "diet-friendly" recipes, motivational musings, and more. THOUSANDS OF PEOPLE HAVE USED MY BOOKS TO BUILD THEIR BEST BODIES EVER. WILL YOU BE NEXT? If you want a "paint-by-numbers," step-by-step blueprint for building a muscular, lean, strong body...faster than you ever thought possible...then you want to check out my bestselling books. An all-in-one training system that delivers MAXIMUM results for your efforts…spending no more than 3 to 6 hours in the gym every week…doing workouts that energize you, not wipe you out. A no-BS guide to supplements that will save you hundreds if not THOUSANDS of dollars each year that you would’ve wasted on products that are nothing more than bunk science and marketing hype. The bottom line is you CAN achieve that “Hollywood body" without having your life revolve around it. No long hours in the gym, no starving yourself, and no grueling cardio that turns your stomach. My book will show you how. Get it today and let’s build a body you can be proud of. If you enjoyed this article, get updates. It's free. 100% Privacy. We don't rent or share our email lists. Hey, I'm Mike Matthews. My books, articles, podcasts, and products help people build their best bodies ever. Will you be next? Are Compound Exercises Better Than Isolation Exercises? All statements have not been evaluated by the Food and Drug Administration. Our content and products are not intended to diagnose, treat, cure, or prevent any disease. Individual results may vary. Enter your email below to get our best articles delivered straight to your inbox every week. Enter your email address below to get instant access to your course! Great! You're in! Check your email to get instant access to your free course.